watercolors and gouache in stillman and birn 'delta', 5 1/2" x 8 1/2"
i'd like to give away one of stillman and birn's newest sketchbooks/journals. 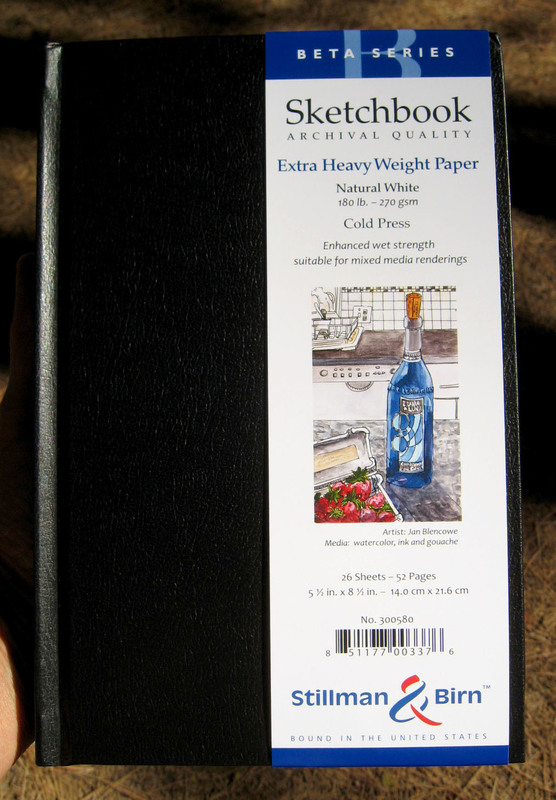 it's a 5 1/2" x 8 1/2" hardbound 'beta', which means that it has extra heavy (180#) white paper in it. the painting at the top of the post was done on the same kind of paper in ivory. i *adore* this paper and these books. you can paint with watercolors (or acrylics or ink or whatever) on both sides of the page and there's no buckling, no showing through on the other side of the page. from the side - it's about a half an inch thick. if you'd like a chance to win all you need to do is say so in your comment, but i must have your e-mail address for your name to be entered. most of you have an e-mail addy associated with your google account, but if you don't you need to e-mail it to me. i'll draw a name next sunday and post the winner's name in the evening. international readers, please feel free to join in! i really have been drawing a lot of 'wild ponies'... they're not easy to photograph because they're lightly painted; i've painted a lot more than this but they didn't want to be photographed, lol. these are in my 'daily book'. i used mostly albrecht durer watercolor pencils to paint them. if you don't receive an e-mail response to your comment i don't have your e-mail addy... so send it to me, lol! 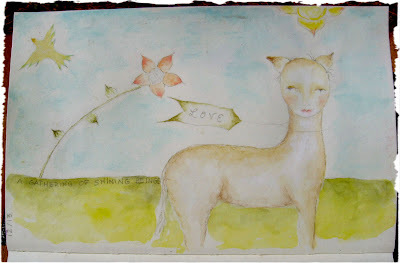 I love your drawings/paintings - all of them whether on paper, wood or beautiful rusty tin. Your work is wonderful. I would be thrilled to enter my name for your draw, how kind of you. and i love my pogo printer too! Oh Lynne please put my name in the draw...I'm still finishing my moleskin, but would love to try one of these journals next. The pages sound wonderful for all the different mediums we work in. LOOOOVE your wild ponies...they make my heart sing. I dont know, there's something about ponies and donkeys I just love! How exciting! I'd love the chance to win. I'm nearing the end of my current journal and was not wowed by the paper. I want to try something of better quality. Thanks! Hi Lynne, I'm new to keeping a journal and maybe a Stillman and Birn's sketchbook/journal is just the little push I need! Your art is beautiful. Thanks for the chance to win your very generous give away! Yes please enter my name in the draw Lynne!It's a beautiful sketchbook and the extra heavy weight paper appeals to me. The wild pony in my sidebar brought me over for a closer look. Your mythical/mystical drawings have a calming effect on me. I imagine the wild ponies materialize out of the early morning mist and then quickly disappear again, leaving one to wonder whether one really did see them. A rare but very precious siting! I love your work and follow your blog. I thought the account of the time spent with your sister was super - such a real special time. My sister is about to move in with us ........I hope we can also share some precious moments. A sketchbook that won't wrinkle after watercolored on would be a miracle...but your sketches look very smooth. Love the little people ponies. Yes, please enter me in the giveaway, you have my email. 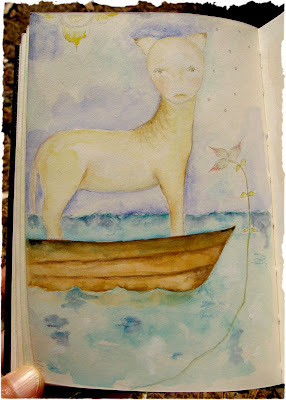 I love your wild ponies and I LOVE the one in the boat :-). Your work is beautiful and quite "ethereal", thank you for showing it to us. I would love to win one of your sketchbooks, as I dont think we have them in the UK. Wild people ponies! How wonderful! I love them, and that little "free" tag hanging from the first one's neck! 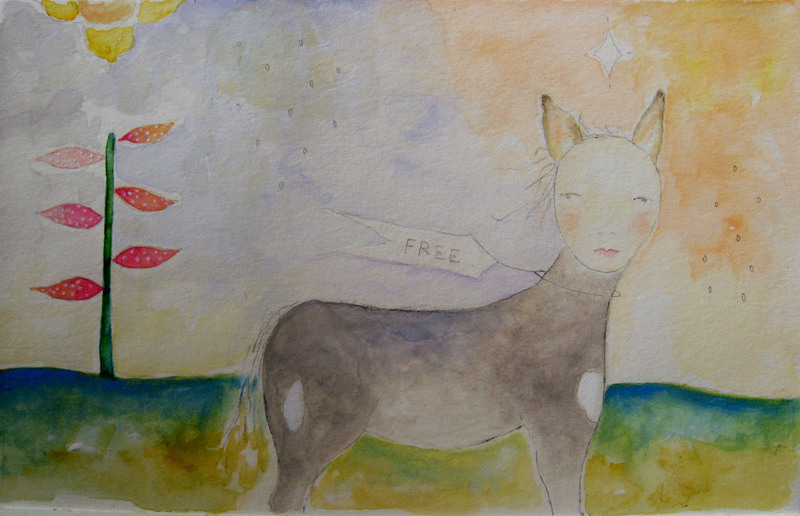 Free and wild - yes! What a great idea to document where you've walked in your beautiful wilderness, Lynne. Those pogo maps a great idea, and they always look so *right* with your art. What a generous offer! I'd like the chance to win it. If I don't at least now I'll know what to purchase as I had been wanting one and didn't know what to get or the water colors. This is all new to me. The map idea is fab too! Sometimes when I go for walks over by the ranch, I feel like a wild pony and would like to gallop off for the day; does this count as a memeber of the W.P. tribe? 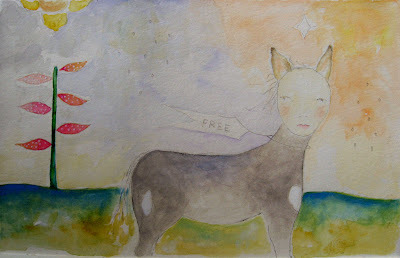 Lynne, i oove your wild ponies series! I have been lusting after these journals for some time! It's very generous of you to do another giveaway and I'd love to be included. Of course I gotta throw my hat into the fray. Yes, yes please. As always your drawings whisper to me, reminding me that life is often stitched haphazardly together and it is in those simple pleasures where life's bounty truly resides; that and dear,incredible friends. a beautiful opening paragraph here. true "authority" always brings freedom with it--the rest is just humans playing power games and elevating themselves over others for ego. ache. Happy b day month and count me in. your wild ponies are a joy to see, each one. I love your topo idea, how fun. i love maps, they are full of endless possibilities. You are an inspiration, Lynne. Thank you for sharing. I love your work and your blog posts. I would love to get the sketchbook as I am paying alimony to my ex and cannot afford to buy one yet. I am still thankful for this because it took the breakup of my marriage to release me into art. Blessings to you. I would love the sketchbook ! Maybe I will fill it with wild beings of my own if I win it ! Much love, Sweet Walking Artist. 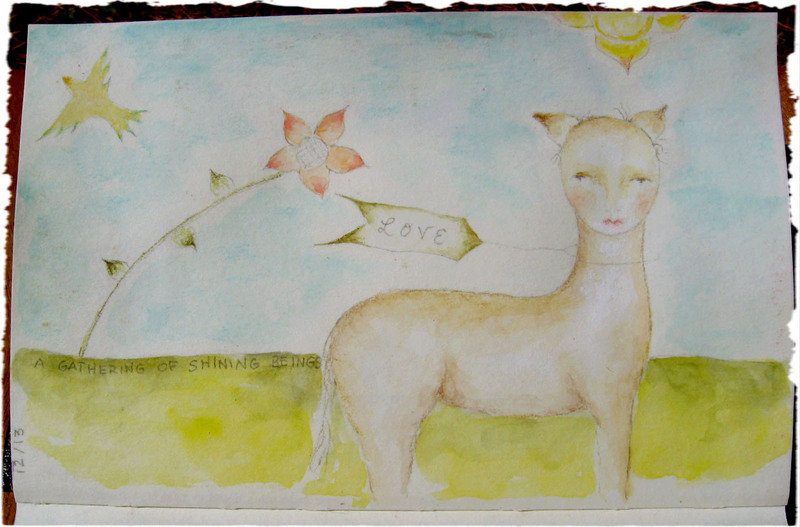 count me in for sketchbook giveaway... your work continues to inspire me for playfulness & whimsy! Being a horse lover I am tickled with your Wild Ponies. I have been drawing imaginary birds as of late. I would so love to get one of the Stillman and Birn's journals as I have not found a source around here anywhere and they sound awesome. Love your wild ponies and I, too, especially like any animal with a twinkle in itts eye and kindness in its hart. 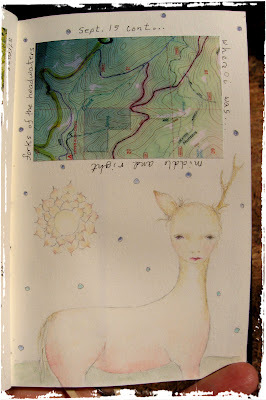 I would love to try my hand at a wild pony in your give away journal! Oh yes, include me in your drawing for a new sketch book. If I can fill mine half as well as you do I would consider myself lucky! You are so sweet to always give away these journals. I am all set in the journal dept, so give my chance to someone who needs some painting space. Lord knows these 16x20's are ALL the space I need right now. Sign. I love your wild ponies. I think that you are that kind sort of wild pony you speak of. Hi Lynne, I always look forward to your blog posts. I absolutely want a chance to win the divine sketchbook. 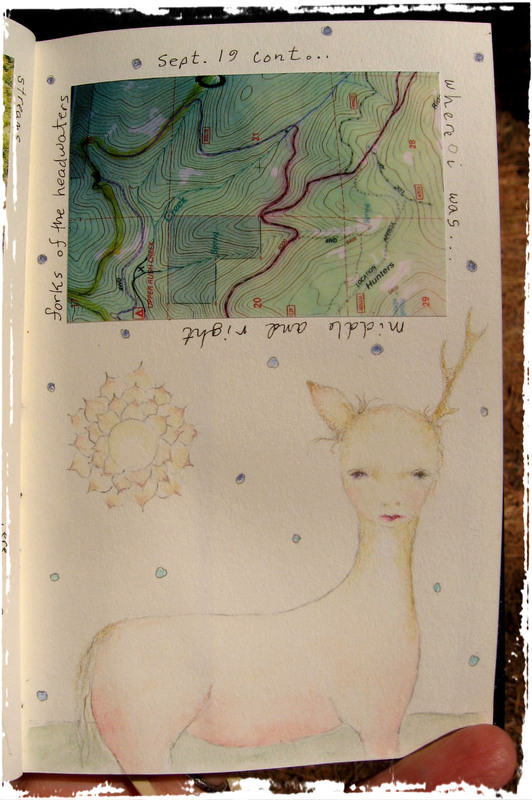 I have one more page in my Moleskine to complete and it is full. I adore how you paint on natural items when you are out walking. Thank you for the chance to win. All your whimsical creatures are interesting but I especially like the ponies. Thanks for the chance at the journal. I make most of mine, so a really nice store-bought one would be a treat. Oh Lynne, I especially love the pony in the boat. Imagine! A Pony In a Boat!!! wow! My kind of dream. Reminds me of the 6 of Swords tarot card, where one is taking a journey across the waters to a new destination, a new way of looking at things, a new way of doing things. A new way of being a BEing. And please add me to your list of peeps wanting a beautiful journal. lynn, i want to win! i changed my email address. i sent you my new one a few days back. um, also? i love the quiet wild ponies. those are the ones that get their hooks in me. Dear Lynnie, oh, I think you are the most beautiful, adventurous wild pony of them all!! Lynne! How are you doing? This is really imaginative. I love horses, and in fact, horses were one of the very first things I ever taught myself to sketch. The second thing I taught myself to sketch was human faces. But had I ever thought to make a hybrid?! No! I want to win one of these.